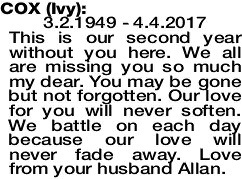 3.2.1949 - 4.4.2017 This is our second year without you here. We all are missing you so much my dear. You may be gone but not forgotten. Our love for you will never soften. We battle on each day because our love will never fade away. Love from your husband Allan.